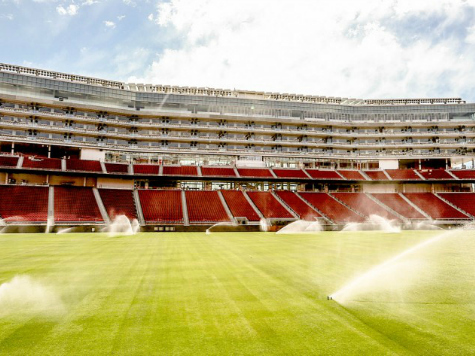 After two years of construction, Levi’s Stadium was opened in July to become the new home base of the San Francisco 49ers. But along with the new venue came higher ticket prices making Levi’s Stadium among the most expensive in the entire NFL. The new Santa Clara stadium will now cost a family of four $641.50 to take in a 49ers game. This makes the 49ers the most expensive game in the league for a family of four. The average ticket for the 49ers has soared 40 percent to $117 per seat, second only to the New England Patriots with its average ticket price of $122 per seat. The Giants, Cowboys, Bears, Jets, Redskins, and Ravens follow the 49ers in the expense of individual tickets. Fans in Cleveland enjoy the cheapest ticket. The $641 cost is computed by the Fan Cost Index, a formula that includes the totaled costs of two adult and two child tickets, four small drinks, two small beers, four hotdogs, two game programs, parking, and two adult-sized caps. According to this index, the NFL average came to $479.45 for that nuclear family. This was a 4.4 percent increase over the 2013 season. By comparison, the average NFL ticket is $84.43, a 3.5 percent increase from last season. But it isn’t just ticket prices driving the 49ers into the most expensive territory. Upon its opening, Levi’s Stadium now has the second highest beer prices in the entire league–$10.25 for a 20-ounce cup. Oakland tops that price at $10.75. Hotdogs, programs, parking, all these items were hiked at Levi’s, too, adding to the rising costs.